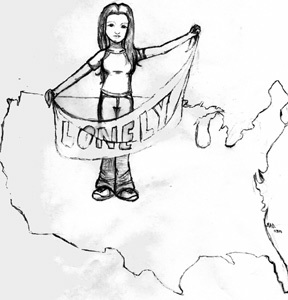 Some Are Alone Here in the U.S. When you come to this country, you bring a suitcase full of dreams and maybe illusions. And you leave all in your previous life behind hoping for a better future. However, would you come here alone as a teenager and face this new and strange country’s life by yourself? But this is the case for some Blair students, too. Some students of our same school have had to experience the same difficulties that some of our parents had. Daniela is a student from El Salvador in the 11th grade. Daniela came to the U.S. without anything or anyone. She came to the U.S. because she wanted to work for a better future that she knew she would not obtain in her country. “Since I was little I wanted to work but my parents did not want me to,” Daniela said. But Daniela, who has been here for four years, has to work double to maintain herself, to pay her own expenses. At the beginning it was a difficult situation because Daniela wanted to come to the U.S, but her parents did not want her to leave. However, Daniela’s desire was stronger that her parent’s desire. Not everything was happiness when they let her come to the U.S. Daniela had to make the most horrible trip of her life. To come to the United States without documents is far from easy. “The way was full of many obstacles and difficulties,” Daniela said. Now, to be here in the United State she feels how much she has grown without her parents. She thinks that now she is a stronger person. “I have learned to value what I have and this has helped me to mature,” Daniela said. At the same time she has to be far from her parents now and she repents many things and she values her parents even more. Her father was trying to give her a better future even though it was not enough for her family to live “I can tell now how much my father worked for me,” she said. Now Daniela’s goal is to graduate from high school and to be able to get a college degree. She knows that the way is long and the struggles she has gone through are just the beginning. But she also believes that the difficult life she has now will help provide a better future. The student’s real name is not used in this article.